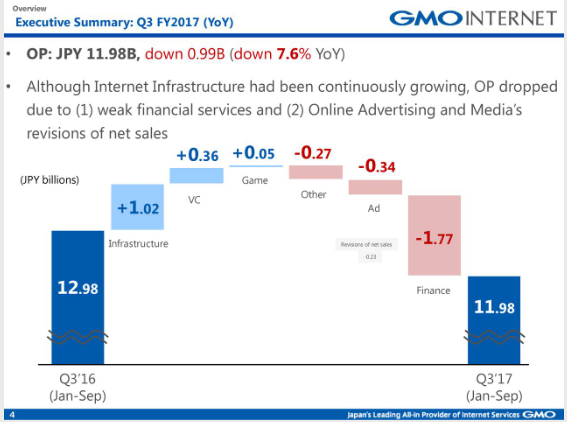 The Japanese Technology Giant GMO Internet just published its report for the third quarter. According to the report, the IT company recorded continuous viable performance in its crypto-related businesses. The report revealed that within one year of GMO operation in crypto-related business, like the production of mining equipment and crypto exchange, it has gained 2.6 billion yen, the equivalent of $22.8 million revenue in the third quarter. A few months ago, the IT company launched a live crypto exchange platform GMO coin, which is its third crypto exchange. It is also involved in mining facilities, mining up to 3,000 BTC and more than 660 BCHs, since it started. Before the launch of the live crypto exchange, GMO had been offering two crypto exchanges and trading services. 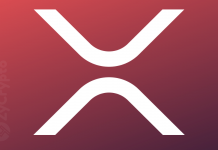 These existing services are brokerage services, which is called, ‘sale office’ and margin trading services, which is also called ‘virtual currency FX’ service. Though the initial coin services supported digital currencies like BTC, ETH, BCH, LTC, and XRP, the live trading platform supports the only bitcoin. 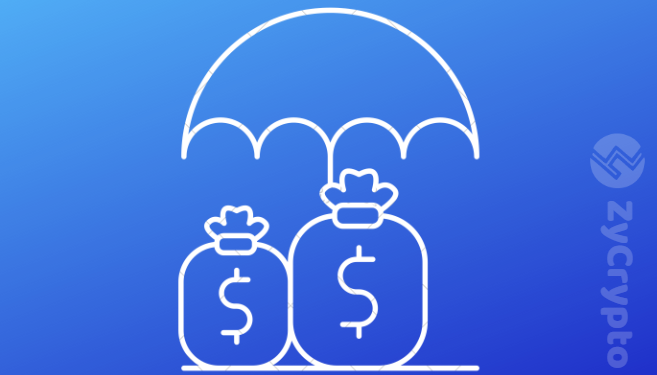 It has a maker fees of 0% and a taker fees of 0.01%, with no withdrawal fees. It also enables traders to buy and sell about 2 BTC in a single order and 1,000 BTC per day. This new platform already has about 208,000 users trading about 89 billion yen, the equivalent of $781 million last month. 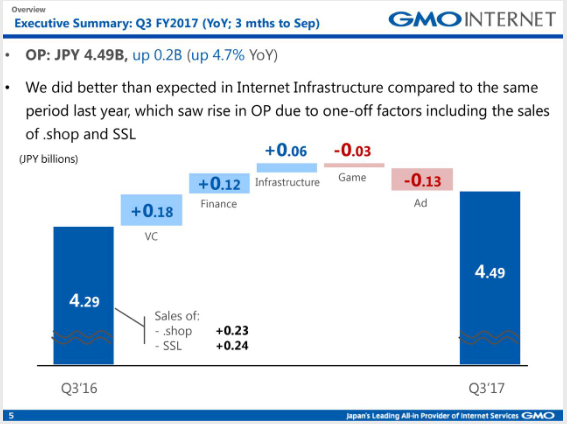 The profit reported by the IT Company from this platform is about 34.4 percent quarter on quarter (QoQ). Mid this year, GMO Internet launched mining machine, GMO miner B3. Its minimum hash power of 33 TH/s: enables users to maximize hash power consumption in their location. It can make up to 33 trillion hash calculation per second. The total hash rate of the GMO mining operations increased to 459 PH/s, in August. A total of 510 BTC and 25 BCH was mined in August, the company also had mined 2,984 BTC and 661 BCH since the launch. Though the company planned to open more rigs, it has not been able to achieve this because of some electrical issues. The company just changed sticker for its Japanese yen-backed currency, GMO Japanese yen, from GJY to GYEN. 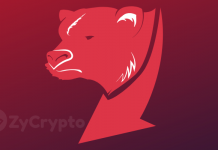 It also announced in October that cryptographic stable coin tied to Japanese which is focused on international transactions will be launched in 2019. After Coincheck hack in January, the company was issued a business improvement order by the Japanese financial service agency. This order warrants that GMO should upgrade its quality of services and render a report on its risk management system to the crypto regulation body in the country. This report shows the performance in Q3. 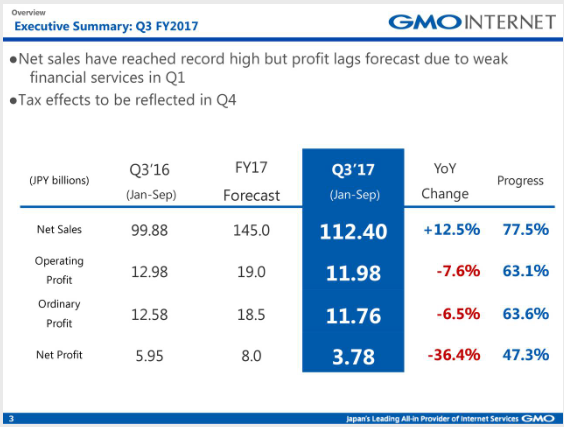 The report shows the GMO performance in the third quarter and the hindrance they encountered.